Story: Otello, a Moor and general from Venice, arrives safely in Cyprus and announces that the Turkish enemy has been defeated. With him is his ensign, Iago, who is angry that Otello has promoted fellow soldier Cassio rather than Iago. To slake his thirst for vengeance, Iago concocts a scheme whereby he proposes to Otello that the Moor’s new wife, Desdemona, is in love with Cassio. Using circumstantial evidence and his powers of persuasion, Iago convinces Otello of Desdemona’s infidelity. The jealous leader orders Iago to kill Cassio, but Cassio survives. Otello then confronts his wife and accuses her of being in love with Cassio, which she denies. Before she can prove her innocence, Otello strangles her. When Otello learns from Desdemona’s attendant Emilia (Iago’s wife) that Iago has fabricated the affair, he kills himself in remorse. 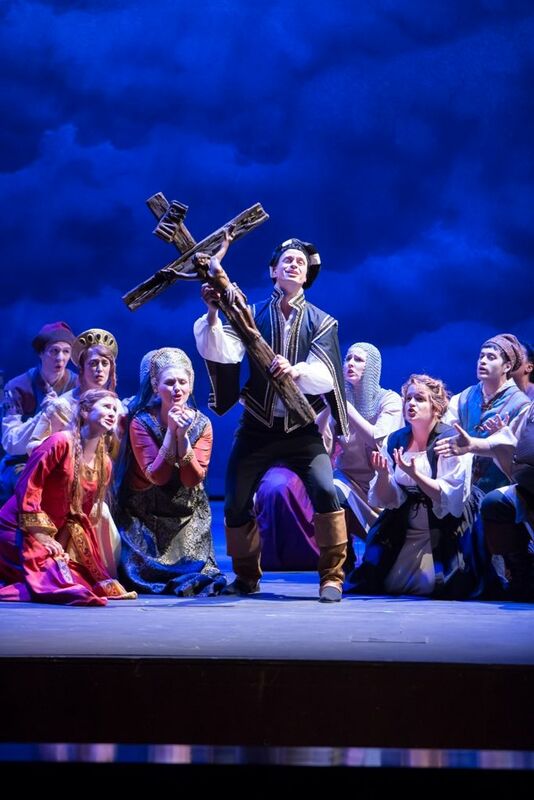 Highlights: Winter Opera Saint Louis has concluded its 2014-15 season with a handsomely crafted production of one of Giuseppi Verdi’s most popular operas, albeit with a focus on singing rather than acting. Several splendid voices contributed to the satisfying interpretation. Other Info: Verdi’s music for the opera was composed after Arrigo Boito wrote a libretto based on Shakespeare’s tragedy Othello, with Otello receiving its world premiere in 1887 at the Teatro all Scala in Milan. Its four acts were separated by two intermissions in Winter Opera’s three-hour presentation, which worked quite well, never seeming to drag or lose its focus. Credit for that should go to director Mark Freiman, who moved his cast fluidly around scenic designer Scott Loebl’s clever set, one accentuated with some especially effective lighting by Sean Savoie of a background canvas, whose clouds conveyed storms or softly cloudy days with equal effect, with the form of a ship at stage right switching to columns in subsequent scenes. While all of the performers proved their skills as singers, Jacqueline Venable Simmons most satisfactorily handled the acting aspects of her role as wronged wife Desdemona. Her delivery was convincing, allowing one to appreciate her splendid singing of Desdemona’s arias all the more. Adam Laurence Herskowitz was imposing enough as Otello and demonstrated an accomplished voice in the title role that surpassed his ability to interpret the complexities of the Moor's tragic character. Likewise, Chris Holmes (a late replacement) was suitable as the conniving Iago, albeit stronger musically than theatrically. Adding fine singing in support of the major players were Robin Bradley as Emilia, Zachary Devin as Cassio, Clark Sturdevant as Iago’s lovelorn tool Roderigo, Mark Freiman as Lodovico and Winston Sullivan as Montano. Kostis Protopapas, summoned on very short notice, did a marvelous job conducting a tight and spirited orchestra. JC Krajicek’s costumes duly represented the late 15th century setting for the tragedy, and Theresa Loebl provided props that suitably complemented Scott Loebl’s set. Impressively, St. Louis now boasts four opera companies that offer splendid local productions that span nearly the entire year in our area. 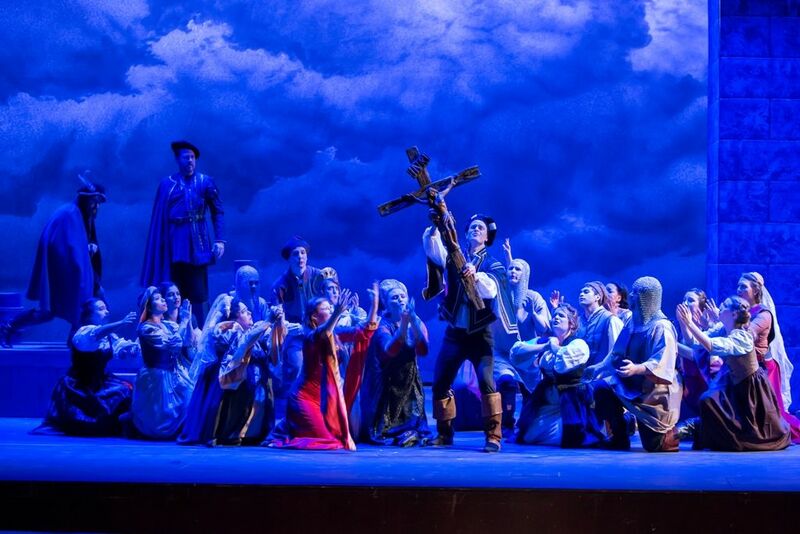 Winter Opera Saint Louis’ recently concluded eighth season, under the careful guidance of general director Gina Galati, is indicative of how both the quality and quantity of area opera offerings continue to blossom. Rating: A 4 on a scale of 1-to-5.